In this new paper, Koopman, Mitchell, and I discuss how the sharing economy has changed the way many Americans commute, shop, vacation, borrow, and so on. Of course, the sharing economy “has also disrupted long-established industries, from taxis to hotels, and has confounded policymakers,” we note. 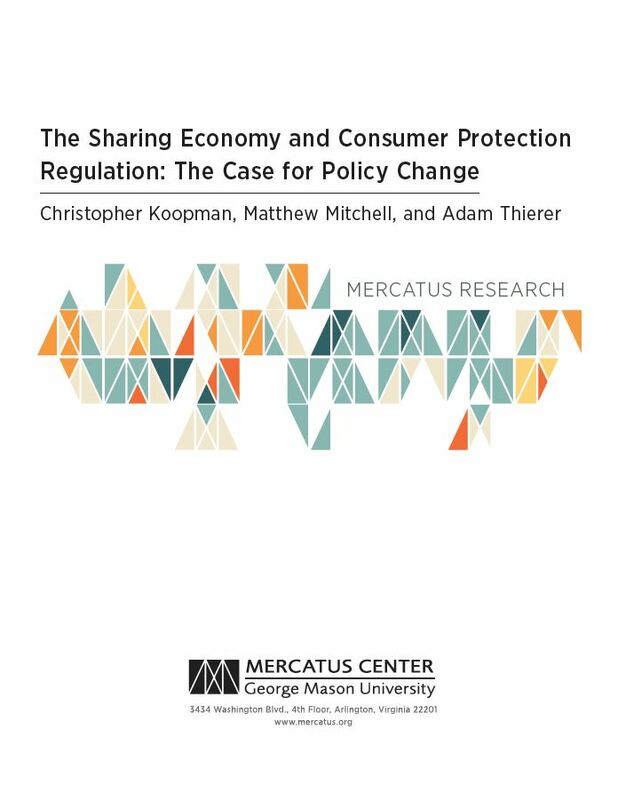 “In particular, regulators are trying to determine how to apply many of the traditional ‘consumer protection’ regulations to these new and innovative firms.” This has led to a major debate over the public policies that should govern the sharing economy. Joshua Gans, professor of Strategic Management at the University of Toronto’s Rotman School of Management and author of the new book Information Wants to be Shared, discusses modern media economics, including how books, movies, music, and news will be supported in the future. Gans argues that sharing enhances most information’s value. He also explains that the business models of traditional media companies, gatekeepers who have relied on scarcity and control, have collapsed in the face of new technologies. Equally important, he argues that sharing can revive moribund, threatened industries even as he examines platforms that have, almost accidentally, thrived in this new environment. Looking for a concise overview of how Internet architecture has evolved and a principled discussion of the public policies that should govern the Net going forward? Then look no further than Christopher Yoo‘s new book, The Dynamic Internet: How Technology, Users, and Businesses are Transforming the Network. It’s a quick read (just 140 pages) and is worth picking up. Yoo is a Professor of Law, Communication, and Computer & Information Science at the University of Pennsylvania and also serves as the Director of the Center for Technology, Innovation & Competition there. For those who monitor ongoing developments in cyberlaw and digital economics, Yoo is a well-known and prolific intellectual who has established himself as one of the giants of this rapidly growing policy arena. Yoo makes two straight-forward arguments in his new book. First, the Internet is changing. In Part 1 of the book, Yoo offers a layman-friendly overview of the changing dynamics of Internet architecture and engineering. He documents the evolving nature of Internet standards, traffic management and congestion policies, spam and security control efforts, and peering and pricing policies. He also discusses the rise of peer-to-peer applications, the growth of mobile broadband, the emergence of the app store economy, and what the explosion of online video consumption means for ongoing bandwidth management efforts. Those are the supply-side issues. Yoo also outlines the implications of changes in the demand-side of the equation, such as changing user demographics and rapidly evolving demands from consumers. He notes that these new demand-side realities of Internet usage are resulting in changes to network management and engineering, further reinforcing changes already underway on the supply-side. 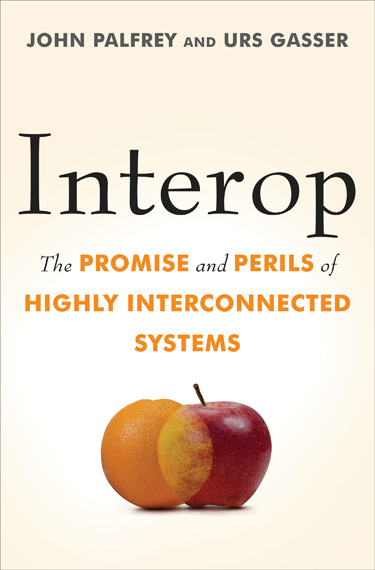 John Palfrey of the Berkmann Center at Harvard Law School, discusses his new book written with Urs Gasser, Interop: The Promise and Perils of Highly Interconnected Systems. Interoperability is a term used to describe the standardization and integration of technology. Palfrey discusses how the term can describe many relationships in the world and that it doesn’t have to be limited to technical systems. He also describes potential pitfalls of too much interoperability. Palfrey finds that greater levels of interoperability can lead to greater competition, collaboration, and the development of standards. It can also lead to giving less protection to privacy and security. The trick is to get to the right level of interoperability. If systems become too complex, then nobody can understand them and they can become unstable. Palfrey describes the current financial crises could be an example of this. Palfrey also describes the difficulty in finding the proper role of government in encouraging or discouraging interoperability. I’m pretty rough on all the Internet and info-tech policy books that I review. There are two reasons for that. First, the vast majority of tech policy books being written today should never have been books in the first place. Most of them would have worked just fine as long-form (magazine-length) essays. Too many authors stretch a promising thesis into a long-winded, highly repetitive narrative just to say they’ve written an entire book about a subject. Second, many info-tech policy books are poorly written or poorly argued. I’m not going to name names, but I am frequently unimpressed by the quality of many books being published today about digital technology and online policy issues. The books of Harvard University cyberlaw scholars John Palfrey and Urs Gasser offer a welcome break from this mold. Their recent books, Born Digital: Understanding the First Generation of Digital Natives, and Interop: The Promise and Perils of Highly Interconnected Systems, are engaging and extremely well-written books that deserve to be books. There’s no wasted space or mindless filler. It’s all substantive and it’s all interesting. I encourage aspiring tech policy authors to examine their works for a model of how a book should be done. In a 2008 review, I heaped praise on Born Digital and declared that this “fine early history of this generation serves as a starting point for any conversation about how to mentor the children of the Web.” I still recommend highly to others today. I’m going to be a bit more critical of their new book, Interop, but I assure you that it is a text you absolutely must have on your shelf if you follow digital policy debates. It’s a supremely balanced treatment of a complicated and sometimes quite contentious set of information policy issues.